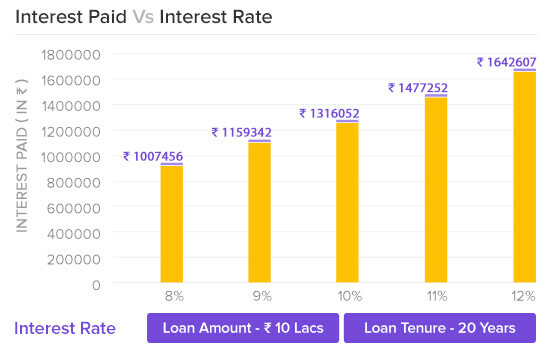 How Does Home Loan Interest Rate Work? Base rate is linked to the RBI’s key policy rates and is subject to change every quarter as per RBI’s new monetary policy. Base rate is different from bank to bank. Base rate & Loan Interest rate – Banks add a spread to the base rate to calculate applicable rates on new Home loans. E.g., if Base rate is 9.00% and the spread is 0.75% (75 bps) then the effective rate for Home loan is 9.75%. The spread is always a constant and is pegged to the base rate. However, the base rate may change on a quarterly basis as per RBI’s policy changes or bank’s Cost of Funds. Yet, the bank may set a higher or lower margin for new loans from time to time and this is why sometimes a new customer may be on-boarded at a better rate on his Home Loan, than that of an existing customer. a) If you have a good/long period/multiple relationship with the lender, then negotiate for a downward revision of rates by paying a one-time fee, which is usually charged by banks. b) Move your Home loan to another bank offering better Interest Rate. As the pre-payment charges have been completely abolished, it’s only the processing fee charged by the new lender that would comprise as a one-time cost of shifting to a different bank. Refer to the above tool for how 1% (100 bps) lower Interest Rate can affect the total Interest payable on a loan. How Does Home Loan EMI Work? How Does Eligibility Calculation Work? How CIBIL Score Impacts Loan Eligibility? How Does Home Loan Tenure Work?